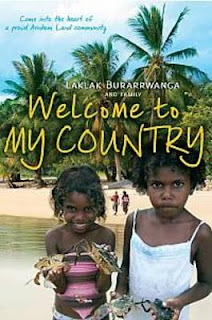 Allen and Unwin recently published a wonderful book called 'Welcome to My Country' by Laklak Burarrwanga, Ritjilili Ganambarr, Merrkiyawuy Ganambarr-Stubbs, Banbapuy Ganambarr, Djawundil Maymuru, Sarah Wright, Sandie Suchet-Pearson and Kate Lloyd. The book is a collaboration between three academics and six Indigenous women from Bawaka and Yirrkala. It is a publication that literally welcomes you to the Country of Laklak Burarrwanga in Arhhem Land Northern Australia. 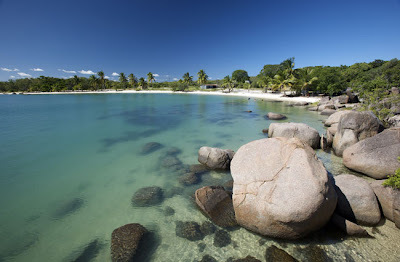 This is a coastal land of crystal clear waters filled with fish, turtle, crab and stingray. The land that adjoins has varied bush fruits, pandanus for weaving, wood for spears, and all that is needed for daily life. But this isn't just a beautiful country, it is a land rich in meaning. This is the place where Laklak Burarrwanga heard great stories, told them to others and learned the great history of her people. These stories were learned from a special library, "a library in the land". This is a library that you cannot destroy. Laklak's personal story includes her long walk across Arnhem Land as a child, and her people's fight for land rights and the right to have a say in their children's schooling. Laklak and her family are a proud and successful Indigenous community. There are many things to love about this book. First, I love the fact that the book records the richness of the history of the people of this special place in a manner that preserves the voices of the Indigenous women and the authenticity of their stories. The non-Indigenous academics who offered leadership to the project have done what few have done before; they have contributed and led the project, but they haven't attempted to reinterpret or explain for others. Rather, the narrator is always an authentic voice of the people whose stories are being told. Second, I appreciate the richness of the stories and the choices that have been made to introduce the reader to the people and their country. Third, I enjoyed the varied genres used to communicate the story of this country. This place welcomes the reader through story, recount, poetry, exposition, lists, explanation and song. Finally, this is a book that changed the authors. The writing of the book and the collaboration between these eight women has enriched their lives. And of course, good writing should always do this. What a wonderful work! Welcome to My Country is a beautifully warm, inviting experience. As soon as I read 'When the moon goes past you can see its reflection (in the water) like the inside of your heart', I knew this would be a very special read. Being immersed in an 'experience' is the way I would describe this book. It is an enticing journey into the heart of Yolngu life, in all its wonder across the physical, artistic and spiritual world. 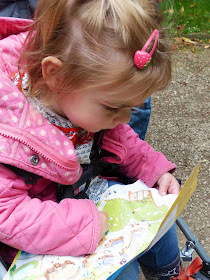 I love the conversational style - we walk, talk and sit down with family on every page. Lovely. In the interview that follows Sarah Wright (the University of Newcastle), Kate Lloyd (Macquarie University), and Sandie Suchet-Pearson (Macquarie University) answer my questions and share their insights into the wonderful collaboration that has led to the creation of this special book. 1. How did this special collaboration with the Yolŋu people come about? Our research collaboration at Bawaka began in 2006 when we (Sarah Wright, Kate Lloyd, and Sandie Suchet-Pearson who are geographers at Newcastle and Macquarie Universities) formed a partnership with Laklak and her extended family who own and manage the successful tourism business Bawaka Cultural Experiences (BCE). 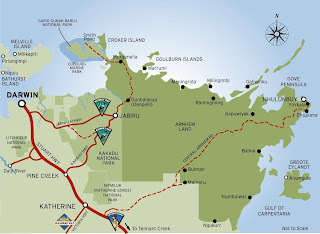 BCE is centered on Bawaka homeland two hours south of Yirrkala in north east Arnhem Land. We were introduced by a mutual friend who asked us whether we would be interested in working collaboratively with some amazing women from Northeast Arnhem Land. Of course, we said yes. From that initial visit, our relationship has grown. It has been a long-term endeavor where we have learnt to trust and respect each other. All of us are teachers in some way, either at the University, at schools in Arnhem Land or as educators working with visitors who come to learn at Bawaka. As teachers, we share a desire to create and distribute knowledge. For Laklak and the other Yolŋu women in our team, it is really important to teach other people about Yolŋu culture and the complexity of Yolŋu knowledge. This is part of their mission in life and part of Laklak’s responsibilities as Elder and Eldest sister. She sees books and other outputs as a way of communicating Yolŋu knowledge to diverse audiences that include tourists, university students, and the general public. It is also a way of reclaiming knowledge that has been provided to academic researchers but is no longer easily accessible to Yolngu people, and of creating a rich resource for cultural transmission for their children. We have told other stories with Laklak and her family. In 2008, we published a book on weaving and culture (published by the Centre for Urban and Regional Studies at the University of Newcastle). The sharing of these stories was made possible by our being women, since in Yolŋu culture basket weaving is women’s business. From the start, our shared womanhood, including our families and children, was an important part of our connection. 2. How did your own research team’s collaboration come about? Our research team is broad. There are the academic researchers Kate, Sarah and Sandie. We were all starting our careers at a similar time and wanted to create a research team that would work collaboratively in a different way from the lone endeavour that you often find in academia. We started working together in 2004. Then we developed our research relationship with Laklak and family in 2006 so our research team became an intercultural team of Indigenous and non-Indigenous researchers, and of people working within universities as well as beyond them. Our research team grew to include the four sisters, elders and caretakers for Bawaka country Laklak Burrawanga, Ritjilili Ganambarr, Merrkiyawuy Ganambarr-Stubbs, Banbapuy Ganambarr - and their daughter, Djawundil Maymuru. Now we are trying to include Bawaka Country as part of our research team too. For Indigenous people, it is important to take the knowledge and agency of animals, plants, winds and other aspects of Country seriously. It is a world-view that is not human-centric. So we are expanding our thinking to see the ways animals and other aspects of Country are important in our collaboration. 3. Is there a next step to the project and the desire to tell the story of Laklak and the Yolŋu people? 4. Are there other stories to be told from Bawaka country? “We feel that writing this book has been like creating a basket. We have tried to make sure that the colors go together and that we have woven something big and beautiful that’s full of meaning and knowledge. We’ve made a connection with each other that’s like a thread linking us together. In the same way the baskets are connected we are all connected now. We all have a desire to work together to build understanding between cultures and to help others learn about, and learn from, Yolŋu culture (Burarrwanga et al. 2008, p. 36). 5. How do you hope to see this book used? What has been its impact so far? We would like to see it used in a range of contexts and we can see it reaching people of all ages. There are stories and messages suitable for young people and we have recently written teaching notes which can be accessed via (http://www.allenandunwin.com) so that the book can be used in primary and secondary schools in all sections of the curriculum including maths, science, English, geography and history. It is also accessible to a broader audience including people working in cutting edge science, to help communicate Indigenous world views, including an Indigenous understanding of mathematics and science. We have had wonderful feedback from a range of people from kids to people working in public health at the University and from those in Indigenous policy setting. Laklak and her family also recognize the book as important knowledge. At the book launch up in Arnhem Land, Elders and representative from different clans came to pay respect to the book and acknowledge the importance of this written form. That was really important to us all and we hope there will be ongoing positive impacts for the community in Arnhem Land - not least because all of the royalties for the book are going up there! 6. Is there some part of the story of the Yolŋu people that has personally touched each of you? How has hearing the story of this people changed you? For us to be able to engage meaningfully with Laklak, her family, and Bawaka, requires a deep emotional investment. The emotional entanglements are fundamental to our work and need to be explicitly acknowledged and foregrounded. Exploring the terrain beyond the words of our research invigorates our reflections and findings, adding other registers for meaning and understanding to be conveyed and developed. To borrow de Carteret’s (2008) metaphor, words from our storytelling encounters become like the thread for patterns in lace: the spaces in between make the patterns visible and more meaningful. Working with Laklak and her family has fundamentally changed the way we think about ourselves. We have been challenged to see ourselves as deeply connected with each other and with our environment. There is no individual that stands separate from anyone else or from Country. It has taken our initial desire for collaboration to a depth we would never have envisioned when we began. 7. Can you see ways that the stories of the Yolŋu connect with European stories? Yes, the stories in some ways connect strongly with European stories, though in other ways they teach us quite different messages. One of the main messages of the book is about sustainability and connection. Laklak introduces the reader to some of the Bawaka/Yolŋu relationships that weave everything together and ensure we remain in balance. Through the stories, songs and actions, she shows how these relationships are kept alive. As non-Indigenous people listen to the stories, hopefully they will think about what they mean for them and how they can live in a connected way in any place. The importance of connection and sustainability doesn’t seem to be stressed as strongly in non-Indigenous stories, or certainly not in the same way, though they are themes that have been increasingly important within contemporary Australian children’s literature. In a way, sustainability is a new story for non-Indigenous people, but for Yolŋu, it is fundamental. There are other similarities and connections between Yolŋu and European stories. For example, the story of Djet tells about a boy who doesn’t share. This concept of sharing and greed is common in European stories too. It is in everything from 'Charlie and the Chocolate Factory' to episodes on Peppa Pig. Yolŋu stories, whether about sustainability, sharing or any of the other major themes in the book, emphasize the messages as fundamentally important. They are understood in very deep ways, and are not provided just as entertainment. These are also stories that are animate in the land unlike European stories that are often understood as fiction. Djet, the sea-eagle, is always there with his cries reminding Yolŋu about sharing. It is a real thing, and very alive. Thank you to Sarah Wright, Kate Lloyd, and Sandie Suchet-Pearson for taking to time to answer my questions.